Now in its second year, the John Tibble Scholarship for Community Engagement is a £1,000 cash prize, awarded to recognise a student’s contributions to the wider community. Mechanical Engineering student Shruti Shalini has received the 2015 Scholarship for her committed work as a tutor in five local primary and secondary schools. 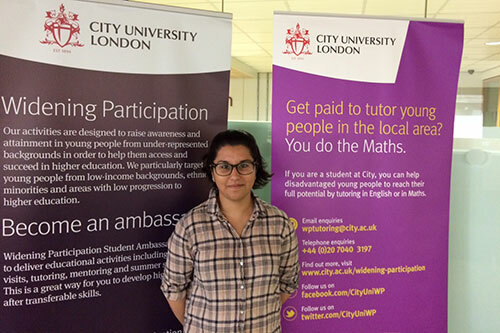 The Widening Participation Outreach team at City University London run a tutoring scheme in primary and secondary schools across London. Supported by a team of tutors made up of current undergraduate and postgraduate students, the scheme provides school pupils with support in English and Maths. In her role as a Widening Participation Outreach tutor, Shruti has tutored at five schools: the City of London Academy Islington; Rotherfield Primary School and Hugh Myddelton Primary School in Islington; Carlton Primary School in Camden and Holmleigh Primary School in Hackney. Working with the same pupils once a week, Shruti supports their Maths attainment and speaks to them about university life, sharing her experiences and encouraging them to make well informed decisions about their futures. In the past year Shruti has contributed more than 100 hours to the tutoring scheme. The scholarship this year goes to someone whose work will make a long term difference to the lives of local children. Having attempted to do so myself in the past, I know that teaching Maths to 15 year olds isn’t the easiest of tasks. Shruti works with passion and enthusiasm and instils a will to achieve through encouragement, by being adaptive and supportive and by fostering self-belief. To learn more about the tutoring programme visit the Experience City website. The John Tibble Scholarship is a £1,000 cash prize awarded to recognise a student at City University London's contribution to the wider community.